Here, I will share with you some of my best couch surfing stories from Europe and the US. I hope my stories help the young travelers without any couchsurfing experience and give them an idea of what this is all about to make them a little more courageous in their travels. Probably this post is the place to thank all of the friends and strangers who have ever taken me into their homes and have been super nice and welcoming. Thank you all! You’re always welcome in my home! My European couchsurfing experience began on my first trip to The Netherlands when I had to stay overnight in Eindhoven because there was no night train to Amsterdam. I decided to stay in a hostel, but the price of 25 € seemed extremely high. I was ready to set up my tent in one of the parks when I found the couchsurfing website on the internet. Two hours after I created my couchsurfing profile I met two locals dressed in strange party costumes. This was my first contact to the lifestyle of Dutch, and what I come to think of the Dutch themselves. My host turned out to be a motorcycle helmet designer and his creative chaos surrounded the whole place. I slept on one side of a large garage, which was furnished for surprise visitors like me. 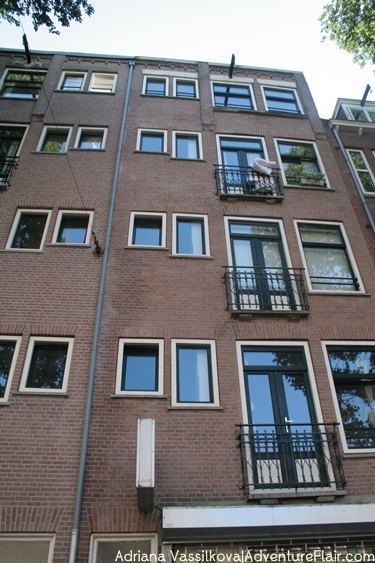 My Amsterdam couchsurfing experience, was much different than the first one, regarding to accommodation.This time I didn’t sleep in hostels in the city center, but at house in a little bit more remote area of the Dutch capital. It’s typical for their buildings to have very narrow stairways making it impossible to move a slightly wider table, not to mention a sofa. People use the cranes placed on the roofs to get their furniture inside. In Barcelona, ​​I was lucky, because my host was living in the most central ‘Gothic’ neighborhood. The location was great, but it was full of suspicious people. In Shreveport, Louisiana, USA I spent a night in my couchsurfing host`s house, located in a luxury residential complex near the town before my flight to New York. In New York City, USA I stayed for a week of literally “a stone’s throw” from Central Park. My host in Philadelphia, U.S. was a guitar player and turned his apartment and backyard into a place for concerts and performances of his band. The so-called “The Club House” welcomed me with a warm atmosphere and great music. That night I was lucky enough to listen his music and eat the most delicious fries in a club in the old city of Philadelphia. In San Diego, USA I spent three nights in the house of a man obsessed with the “Couchsurfing” idea. Everything he was doing was related to hosting and guiding people, mostly girls from all over the world. In less than a year his profile jump in the rating system and turns him into a top host in the San Diego area. To be honest everything was a bit strange because that man never left California before, but seemed that the whole world was sleeping in his house. Otherwise, the location of his house was great. Just a few meters from the Mission Beach, one of the most famous beaches in the area. During my stay, I had to share “the couch” with 11 more people. That’s right, we were 12 couchsurfers staying together for one night and it was like one of those couchsurfing horror stories. Aside from that it was pretty fun. All the new people I met there and their couchsurfing stories were very interesting. In Santa Barbara, California, USA I found one of the most joyful couchsurfing hosts that I have ever stayed with. Ready to have fun, talk, laugh, drink, yell and walk barefoot in the streets, Mark made me full of energy, which I needed to continue my journey. :) I felt like I’ve known him for many years. I hope to find more “Couchsurfing” hosts like him in the future. After my adventures in Santa Barbara, I went to San Francisco, California, USA. The couchsurfing host I encountered there was half Peruvian, half American, knew a little Bulgarian and even had visited Bulgaria several times. The interesting part was that his profile on Couchsurfing had not a single review and my trust was somewhat “blind.” At first I was scared that this could be my first bad couch surfing experience, but as usual, my inner feelings did not give up. This is my couchsurfing experience so far. What about yours?